All gloves are off in the battle of the digital wallets. Paytm’s website has been down several times over the last week. Users have been unable to transact, and have taken to Twitter to complain. Paytm has clarified that the downtime is thanks to the heavy loads their systems have been experiencing, and has brought its site up each time. But when Paytm today published a blogpost about a bug in their iOS app that was causing the app to hang, and some users would need to update it to be able to use Paytm, MobiKwik CEO Bipin Preet Singh retweeted the following tweet. “Hi Uber_India, since you are having trouble with Paytm wallets, it would be a great time to allow MobiKwik payments,” the tweet said. Paytm had snagged a lucrative partnership with Uber in 2013 when the cab aggregator had just entered the country. Because of the prevalent two-factor authentication rules that made credit and debit cards hard to use, Paytm became the wallet of choice for Uber users. Uber and Paytm have both flourished since, and had fed off each other’s growth. And it’s not just that – MobiKwik’s official Twitter handle is individually tweeting at people who’re complaining about Paytm to start using their services. MobiKwik’s attempt to catch Paytm with its pants down might feel a little unsportsmanlike, but Indian startup bigwigs haven’t shied away from such situations in the past. 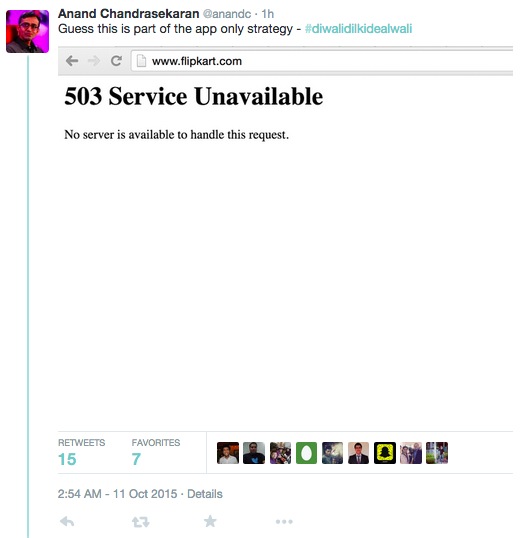 Last year, Snapdeal’s then-CPO Anand Chandrasekaran had mocked Flipkart’s app-only strategy, tweeting a screenshot with Flipkart’s website down and saying that perhaps it was a part of its plan to move away from desktops. But this isn’t the first time MobiKwik has trained its guns on its bigger competitor. Last week, cofounder Upasana Taku had said that while MobiKwik was doing real business, Paytm was going around putting up stickers outside media houses. CEO Bipin Preet Singh has also claimed that Paytm’s supposed 15 crore claimed users are fake, and the actual number could be half of that. Mobikwik also had a war of words with rival wallet Freecharge insinuating that the latter’s numbers in an industry report seemed fudged. Paytm, so far, has refrained from commenting on MobiKwik, focussing instead on its own promotional efforts. But MobiKwik is stepping up its own promotional efforts – often modeled on Paytm’s – and might be a matter of time before the biggest player in the wallet space responds.